Le French Book (NY), 9781939474186, 221pp. When a major Parisian modern art event gets unexpected attention on live TV, Chief of Police Nico Sirsky and his team of elite crime fighters rush to La Villette Park and Museum complex. There, renowned artist Samuel Cassian is inaugurating the first archeological dig of modern art, three decades after burying the leftovers of a banquet. In front of reporters from around the world, excavators uncover a skeleton. Could it be the artist's own son? And does that death have anything to do with the current string of nightclub murders by the "Paris Butcher"? 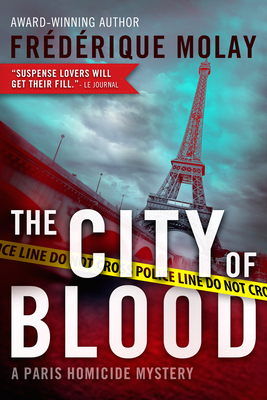 On the site of the French capital's former slaughterhouses, the investigation takes Nico and France's top criminal investigation division from artists' studios to autopsy theaters and nightclubs in hopes of tracking down the murderer who has turned this Paris park into a city of blood. Called "the French Michael Connelly," Frederique Molay graduated from France's prestigious Science Po and began her career in politics and the French administration. She worked as chief of staff for the deputy mayor of Saint-Germain-en-Laye, and then was elected to the local government in Saone-et-Loire. Meanwhile, she spent her nights pursing a passion for writing she had nourished since she wrote her first novel at the age of eleven. The first in the Paris Homicide series, The 7th Woman, won France's most prestigious crime fiction award and went on to become an international bestseller, allowing Molay to dedicate her life to writing and raising her three children."